Here’s some good news for anyone concerned that last generation’s consoles are holding back today’s game developers: Fallout 4 is current-gen-only, Bethesda says. No quiet last-gen releases coming down the road. Some might have assumed as much when the publisher announced Fallout 4 last week for PC, PS4, and Xbox One, but there were certainly gamers—myself included—worried they had a quiet last-gen port in the works to maximize sales. 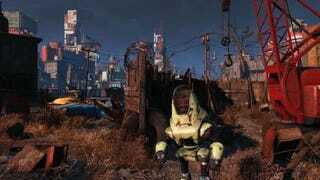 Fortunately, that’s not happening, according to Bethesda global community lead Matt Grandstaff, who says the next Fallout ain’t coming to 360 or PS3. 1) It means Todd Howard and his team at Bethesda Game Studios will be able to take advantage of the expanded memory limits on today’s hardware, which is especially important for an open-world game like Fallout, where everything—from interactive objects to building interiors—takes up a ton of memory. 2) It totally debunks that dumb Reddit rumor, just in case our debunker wasn’t enough for ya.